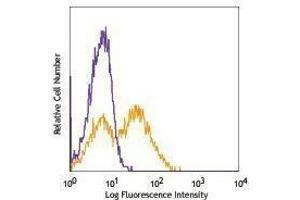 Reinigung The antibody was purified by affinity chromatography, and conjugated with Pacific Blue™ under optimal conditions. The solution is free of unconjugated Pacific Blue™. Hintergrund CD80 is a 60 kD highly glycosylated protein. It is a member of the Ig superfamily and is also known as B7-1, B7, and Ly-53. CD80 is constitutively expressed on dendritic cells and monocytes/macrophages, and inducibly expressed on activated B and T cells. The ligation of CD28 on T cells with CD80 and CD86 (B7-2) on antigen presenting cells (such as dendritic cells, macrophages, and B cells) elicits co-stimulation of T cells resulting in enhanced cell activation, proliferation, and cytokine production. CD80 appears to be expressed later in the immune response than CD86. CD80 can also bind to CD152, also known as CTLA-4, to deliver an inhibitory signal to T cells. Handhabung Protect from prolonged exposure to light. Do not freeze. Informationen zur Lagerung The antibody solution should be stored undiluted between 2°C and 8°C.